Thank you to the members who represented our club at the 395 Squadron Annual Coin parade. Ken, Spencer, Lorne, Bert, Duart and Bill. A great honour was bestowed upon me by the 395 squadron. Lorne accepted it on my behalf. I am now a member of the ancient and Loyal Order of Griffon. I have made a sacred promise to uphold the regulations and traditions of the order, to be righteous and honourable in all matters. I will proudly carry the coin at all times. There are a couple of events which might be of interest to you all. Last week, Ingrid received a UPS delivery that brought a huge smile to her heart! She is proud to report that District 5370 is an official Peace Builder District within Rotary International! Many heartfelt thanks to all the clubs and individuals who have contributed to our Peace Builder fund to make this initiative a reality. In fact, we have received donations from almost all clubs in the District and we have almost enough funds for a second donation to the Peace Centers! There is still time for the remaining few clubs or individuals who are so inclined to send in a donation. Parkinson Disease (PD) is a neurodegenerative disorder that affects motor and non-motor functions due to a lack of dopamine in the brain. Dopamine allows nerve impulses to travel smoothly from one cell to the other. When dopamine is reduced, the messages from the brain to the nerve cells aren't properly transmitted, resulting in the recognizable tremors, rigidity and slowness of movement in PD patients. The average age of diagnosis is 58, though PD also affects many people in their 40s, 30s and even 20s. Parkinson disease is the second most common neurodegenerative disease, after Alzheimer's and currently affects thousands of Albertans. There is no known cause or cure. Parkinson Association of Alberta recognizes that every person is unique and so is the treatment of their PD. They offer a wide variety of support and resources to help navigate the healthcare system and management of Parkinson disease. 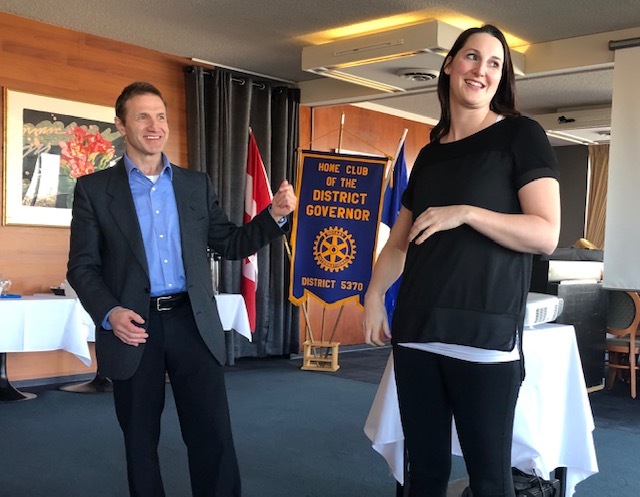 April spoke about how our club will be supporting Parkinson Alberta with a fundraising event on November 16, 2019. The event is a boxing gala that will be held in the Blatchford Hanger at Fort Edmonton Park.